Yes, like this is the honeymoon, right. And then Klein, my husband, my ex-husband, said, "Joan-Joan," you know, like, because he's very liberal about me using the boyfriend as a model here, but he said, "you're going to -- I like to think this album is about us, you know, like you're going to limit peoples' vision by putting a leading man in there." I said, "look, okay, I'll get you in there some way." So then it was my birthday. And this bouquet of yellow flowers came only they were very formal, very French with -- very even and then with a rose head shorter length around the bottom of the pot and it was three days after my birthday and I still didn't have a clear image and I thought oh - roses are romantic. I'll do the roses. And I pulled them out and I put them in kind of a wild bouquet and I finished the painting but where the picture frame is in the lower left it looked like a weeping elephant. You can still see one eye here, you know, like here's the eye and the tear and then there was a kind of a nose that went over there and it was bothering me so -- and then Klein levied this criticism and I said, "look if I have two -- what if I put the picture of you with your tongue hanging out from our first Christmas together with my Christmas socks up around his ears, right? Then there's no -- it's not about one guy, you know, it's just about, you know, the beginning of romance." So I did that for the musical director and got rid of the weeping elephant at the same time (laughs). Would you acknowledge certain artists that you feel you draw on for inspiration or as models as painters? 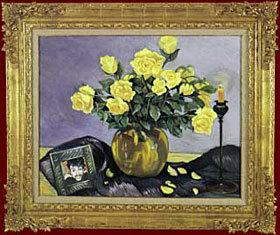 Well, in this particular one, I got out -- Manet did a striking bouquet of mixed flowers but with a yellow rose. So I laid it out. It's in a glass cylinder, and the(inaudible) in the glass, a beautiful thing about that painting. While I was painting it, these flowers -- I worked 18 hours on this painting. All but the picture with Klein in it was done in a straight 18-hour stint because the flowers were dying as I worked. I did the broad brush first, and then I, you know -- this is not answering your question, but I'll get back to you just before I forget this -- when I looked up I started with the flowers and I worked my way down and did the scarf and the candle and everything, and when I looked up, all the flowers were dead and the Monet --or the Manet -- book was, like, lying on the floor with all his flowers were kind of perky, and I thought in this way you preserve a bouquet, you know. I mean, to watch them wilt in the course of working with them was really kind of something, you know. And again as a symbol of romantic love, the rose is perfect, you know, (laughs) because it just doesn't last very long, you know?